It's that time of year again. Some of us make resolutions, some of us try to declutter our homes, others of us choose a word or phrase to try to live by for the coming year. Me? I attempt all three. A few of my resolutions may make it to the habit stage, but most will probably die of neglect. (Hey...I am so happy to watch Biggest Loser, but don't feel the need to get sweaty when I have cookies in my hand!) I am always attempting to declutter and clean (isn't that the definition of motherhood???) but my endeavors are made much more difficult by the three other bipeds who live with me. I can, however, manage to be inspired by a word or phrase that is large enough to take me (and all my baggage) on a ride through the entire year. It is a little nerve-wracking though, isn't it? Kind of like buying a car - you have to like not only the make and model, but also the color and the way it handles on the road. 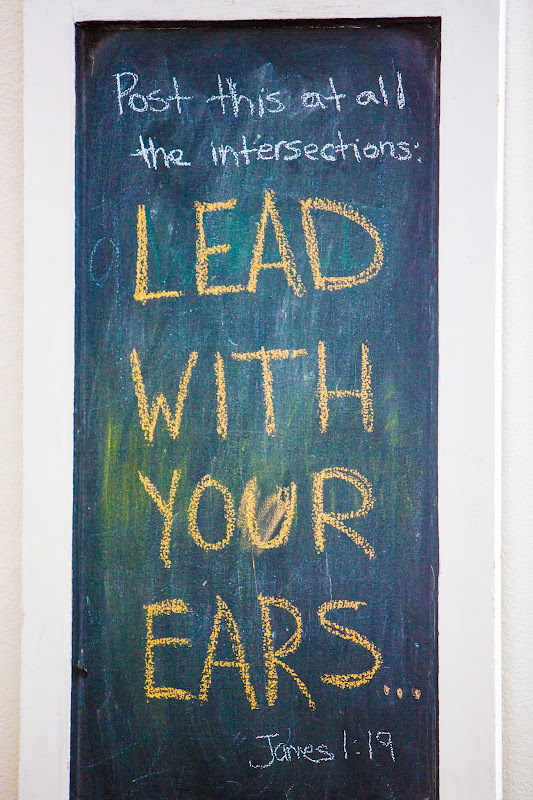 Lead With Your Ears is a reminder to be listening intently in whatever circumstance I am in. It is an invitation to take notice of not only the words that are spoken, but the unspoken ones too. Lead With Your Ears urges me to hear what the person in front of me is saying and, at the same time, what God is saying. To Lead With Your Ears is, for me, a seeking to understand before I am understood. It means not being so worried about getting to say what I want (the already rehearsed monologue in my head! ), but instead really engaging with the conversation and situation at hand...and responding to those. Lead With Your Ears carries with it an unknown and mysterious element too. Who knows what I'll hear? But the practice of attending to the moment, the people and the God around me is enough to begin the journey. I guess I will just have to keep straining my ears to listen as they lead me through 2015! May we all listen well...and hear wondrous things this year!! What is your word or phrase for the year?